iac making of series: WOULD YOU RATHER WATCH THE FIREWORKS? The making of Would You Rather Watch the Fireworks? Most of us have problems with computers. They are said to be logical, rational and predictable, and maybe most are, but not mine. This is a story that epitomises the erratic and subversive cunning that is in the temperament of my computer and its suspected latent potential to take charge. I have made one animation previous to WYRWTF? It was called Wings, was one minute long and told the tale of the ultimate escape from reality. It was judged to be the best animation at the IAC 2003 competitions. WYRWTF uses similar drawing and composition techniques but made with more confidence and care. I did not use a storyboard, I simply started at the beginning and worked through the concept I had in my head. This concept constantly changed and inevitably the final film was not that of the original idea. The voice over is that of my wife, Wendy Lockwood. The words come directly from cut-ups of various computer manuals. 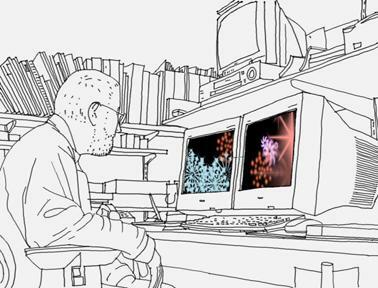 Animation, as I practice it, is a solitary affair. It demands long hours of repetitive procedures and a month of hard work may well result in just one minute of film. Professional animators usually work to at least twelve frames per second, I work to five frames per second. This does result in some flicker, but there has to be a balance between time and effect. The man is me and the house is mine. I filmed myself and used this to form the basis for the animation. In Adobe Premier each film section to be animated was converted to 500% speed, saved in Filmstrip (in three second sections, Filmstrip is very heavy) and opened in Photoshop. 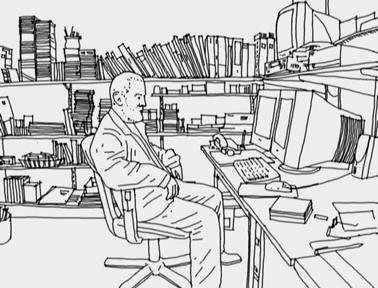 In Photoshop, Filmstrip shows as a sequence of frames, and these were translated into the animation drawings. I have a Wacom tablet which enables me draw directly onto the monitor. Once the drawing is complete it is reopened in Premier, converted to 20% speed (i.e. back to normal speed) and the section is complete. 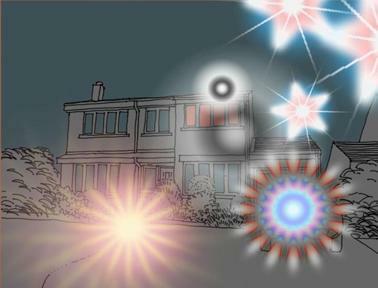 The fireworks were designed in Photoshop, and the animation of them was created in Adobe After Effects. Would You Rather Watch The Fireworks? was one of the UK offical entries to UNICA 2005, Belgium.